Festos ExoHand is an exoskeleton that can be worn like a glove, combining smart features invented by the engineers with the smart and flexible solutions from nature. The fingers can be actively moved and their strength amplified; the operators hand movements are registered and transmitted to the robotic hand in real time. Tell us a little bit about Festo the company and furthermore its Future Concepts. The Festo Group is one of the world’s foremost enterprises in automation technology and the world market leader in basic and advanced technical training. Festo’s pneumatic and electric drive technology stands for innovation in industrial and process automation. Festo’s innovative approach results in maximum productivity for the customer, a worldwide presence and close systems partnerships with customers. Festo currently employs 15,500 employees worldwide in 59 national companies. The turnover for the fiscal year 2011 was € 2.1 billion. At the learning enterprise Festo, education and training account for 1.5 percent of overall turnover. Biological evolution can be described as an optimization strategy for the adaptation of organisms to their environment resulting in highly energy efficient solutions. What could be more obvious than transferring these principles to the development of new technological methods and innovation processes and thereby learning what can be put to use in automation? In this context, criteria such as flexibility, minimal weight in relation to the moving mass, and energy considerations are acquiring increasing significance. Nature shows in a wide variety of ways how maximum performance can be achieved with a minimum of energy consumption. What is the Bionic Learning Network of Festo? Festo’s Bionic Learning Network is a cooperation between Festo and renowned universities, institutes and development companies. It is the Bionic Learning Network’s aim to apply principles from nature to technology and industrial applications. The Bionic Learning Network develops and optimizes Festo’s mechatronic products and processes with the aid of bionics. However, here we want to stress that we do not understand bionics as biomimetics or biomimicry. Our aim is not to copy nature but to learn from nature and take inspiration from its vast pool of highly efficient and smart solutions. Why does Festo take a bio inspired approach in its work? Nature’s elegant solutions were optimized for billions of years by evolution to become energy efficient, flexible, light weight and so on. Here the engineers can learn a lot from nature and take inspiration. Furthermore, nature with its vast pool of solutions opens up new ideas for technical solutions engineers never thought about in the past. Of course, skilled and well-educated engineers are crucial to the nix in order to transfer the biological concept into a functioning technical application, showing that education and training are highly important. With this in mind, Festo Didactic has become the global market leader in technical education and training. One of your Future Concepts the ExoHand has been nominated for the international Hermes Award 2012 – please explain how it works. 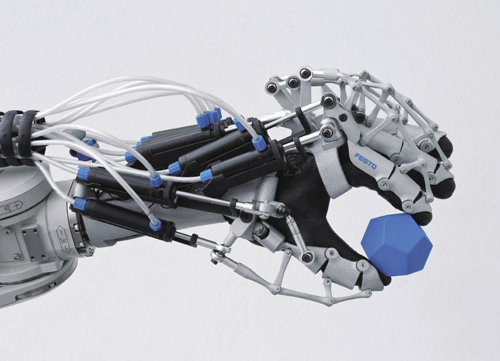 Festo’s engineers of the Bionic Learning Network took inspiration from the human hand itself to create the ExoHand since the human hand is one of the best tools nature ever invented combining strength and flexibility. Therefore an exoskeleton was developed that supports the human hand from the outside and reproduces the physiological degrees of freedom – the scope of movement resulting from the geometry of the joints. Eight double-acting pneumatic actuators move the fingers so that they can be opened and closed. For this purpose, non-linear control algorithms are implemented on a CoDeSys-compliant controller, which thus allows precise orientation of the individual finger joints. The forces, angles and positions of the fingers are tracked by sensors. Festo’s ExoHand is an exoskeleton that can be worn like a glove, combining smart features invented by the engineers with the smart and flexible solutions from nature. The fingers can be actively moved and their strength amplified; the operator’s hand movements are registered and transmitted to the robotic hand in real time. The objectives are to enhance the strength and endurance of the human hand, to extend humans’ scope of action and to secure them an independent lifestyle even at an advanced age. Due to the yielding capacity of its pneumatic components, the ExoHand also offers potential in the field of service robotics. In the rehabilitation of stroke patients, it could already be used today as an active manual orthosis. How did bionics inspire the design of the ExoHand? Biological solutions are light-weight, energy efficient and highly integrated. The engineers had these concepts in mind when they developed the ExoHand. The biggest inspiration however came from the human hand itself. The exoskeleton embraces the hand of the user in a natural fashion allowing the user to move its hand freely and transferring this movement to a robot. This was only possible by understanding the anatomy and function of the human hand as well as understanding the needs of the user. What is Festo’s vision on what a Factory of the future may look like? Can you tell us a little more about some of the research and development efforts you have going on at Festo? Human machine interactions will become more and more important in the future. The ExoHand from Festo already combines human intelligence with the capabilities of a robot and demonstrates a unique intuitive human machine interaction. Further prevalence of bio-inspiration will be seen in surface technologies including new materials as demonstrated by the NanoForce Gripper. Possibilities are plenty and we are confident that nature will continue to inspire and surprise us with further fascinating and intelligent principles across various fields of research. The pool of natural solutions is colourful and diverse.